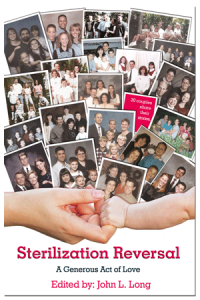 Sterilization Reversal – A Generous Act of Love is a compilation of 20 stories of couples who were sterilized and then sought sterilization reversal. It is the first book that discusses, from a Roman Catholic perspective, the destructive impact that sterilization has on marriage and the joyous spiritual and marital renewal experienced by couples after reversal. As such, Sterilization Reversal – A Generous Act of Love is a unique resource for clergy, religious educators and laypeople. It is an especially useful tool for the pastoral counseling of persons who have repented their sterilization. It is also a particularly effective means of informing people who are considering sterilization of the emptiness and heartbreak that often follow as well as the NFP alternative that nourishes the marital relationship rather than attacks it. Sterilization Reversal – A Generous Act of Love is the result of nearly four years of effort by 20 families who were once sterilized and then experienced God’s call to reversal. Each of these 20 families experienced the negative effects of sterilization in a wide variety of ways. Out of these difficulties, each repented their sterilization and ultimately found a spiritual conversion, culminating in a realization that God was calling them to go the extra mile – beyond simple repentance to an wholehearted determination to do God’s Will in their lives and restore to Him the dominion over their fertility that they had taken away by their sterilization. Steve Koob, Director of One More Soul (OMS), heard many of these stories from Peggy Powell who ran a Sterilization Reversal Hotline for three years, giving reversal information to hundreds of callers. Peggy’s experience on the hotline convinced Steve that there was a need for a greater outreach to people who had repented their sterilization and did not know what to do next, as well as a need to educate people considering sterilization about the sorrow and sense of remorse and loss that so often followed sterilization. Steve sought out John Long, an officer in the Army who had written the story of his reversal for the OMS Update. John agreed to collect a group of reversal stories and edit them into a book. As the first book that discusses, from a Roman Catholic perspective, the destructive impact of sterilization on marriage and the renewal experienced after reversal, the book was intended to be a valuable resource to inform clergy, religious educators and laypeople about these moral and marital issues. Given that sterilization has become the contraception of choice for married Catholics with children, the two pastoral appendices that discuss the Church’s teachings about sterilization and reversal in a new, clear and authoritative way are especially noteworthy. Nearly four years later, this project is now reality. Sterilization Reversal – A Generous Act of Love contains two appendices written by a bishop and a theologian that discuss the Church’s teachings about sterilization and reversal in a clear and authoritative way not previously seen in the limited literature on this topic. These two pastoral documents include the essential “why” that is often missing – yet is essential to a complete understanding and support of the Church’s teachings. They also provide a thorough analysis of the underlying moral issues that sterilized persons must deal with as they realize the moral impact of their actions, both before and after the Sacrament of Reconciliation, and especially as they consider the possibility of reversal. In addition, a urologist and a female obstetrician gynecologist have contributed two informative medical appendices that describe how male vasectomy and female tubal ligation are performed and how they are reversed. These medical appendices also address the physiological, medical and emotional results of male and female sterilization in language that is easily understood by all . This entry was posted on Tuesday, October 22nd, 2013 at 3:28 pm	and is filed under Featured, News & Commentary, Online Books, Publications, Sterilization. You can follow any responses to this entry through the RSS 2.0 feed. You can leave a response, or trackback from your own site.